In this case study, we follow the journey of two Sites For Law Firms clients: Moore Law, PC and Paul Law Firm, PLLC. Both clients requested a custom design and additional law firm marketing services. Despite both law firms being very well-respected offline, they were not properly represented online. Neither had a strong web presence nor could either be found easily for their respective area of practice within their geographical location. These two law firms were not able to capitalize on motivated prospective clients using the web as a search tool for law services. Within 3 months of signing up for Sites For Law Firms, both clients are now represented on the first page for their main keyword targets and are now in the position to capture any online lead seeking the services they provide. 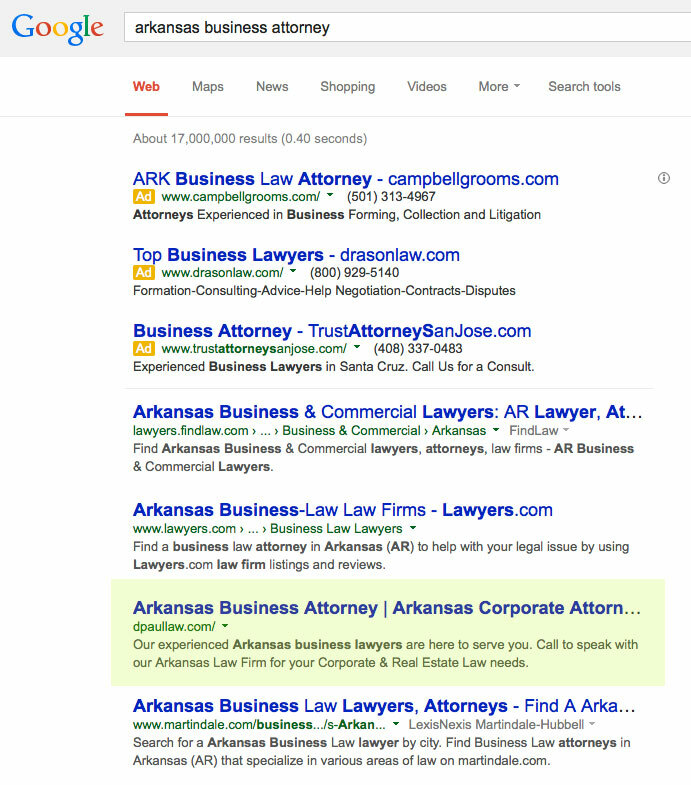 It’s worth noting that Paul Law Firm, PLLC is on the first page of Google for “Arkansas Business Lawyer” as well. The Sites For Law Firms platform is great at creating unique and relevant content based on a given law subject matter. Once the generated content is created, we uniquely tailor the content to correspond with each client’s company culture, mission statement, and personality. We work hand-in-hand with our clients to carefully craft the message they want to convey about their firm to its prospective clients. If you would like to do it all yourself, it will only take a few minutes of effort for you to populate your pages with relevant content. 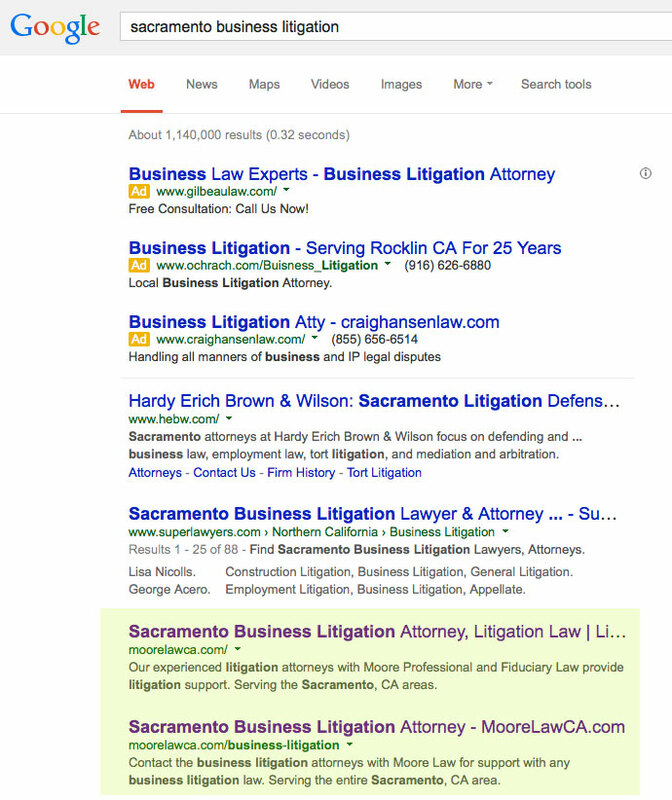 The Sites For Law Firms platform was built on the premise of strong on-site SEO. That means all links are already optimized for title tags and internal linking. The keywords used within our unique content are high-trafficked keywords that have been thoroughly researched. Our users benefit greatly because these details, which are often ignored by website owners, are taken care of for you by the platform. When you build a website, you still need to market it. At the Sites For Law Firms, we understand where our clients’ audience exists. So we go out and ensure they are represented at those web properties. And that’s exactly what we did with Moore Law, PC and Paul Law Firm, PLLC. By casting a larger net online, we gave both law firms the best opportunity to be found when prospective online clients need it the most. At Sites For Law Firms, it’s of our belief that you should focus on practicing law, not web design or internet marketing. We want it to be a pleasure to create your law firm website, not a chore. Our service doesn’t end at getting your website online. We’re also here to help you when you need it. We have been helping attorneys succeed online for more than a decade. The examples above are only 2 of many happy clients. Are you ready to build up your law firm clientele? If so, we’re here to help. Contact Sites For Law Firms today.